Thelma Mae Earnshaw peeped through the lacy curtains that adorned the side window of La Belle Epoque, her quaint(ish) inn and tearoom. She was trying to figure out what had her archenemy and business competitor, Rose Freemont, in such a fuss. Another cozy mystery round-up review! 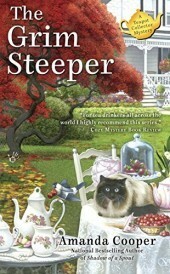 The Teapot Collector Mystery series is centered on Sophie Taylor, who at age 29 has just been through the rise and failure of her own New York City restaurant. Her father is eternally traveling on business, and her mother would like her to marry a nice (wealthy) young man already and turn into the sort of Society Lady Sophie has never wanted to be. 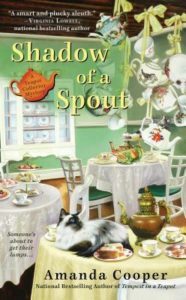 Instead, Sophie heads upstate to Gracious Grove, a tiny town with more interest in tea than seems reasonable (maybe because the town also happens to be dry). There, her octogenarian grandmother, Rose Freemont, runs Auntie Rose’s Victorian Tea House and could perhaps use a hand. Next door, Thelma Mae Earnshaw runs a rival tearoom, because her entire life seems to revolve around trying to get even with Rose for a supposed slight decades ago. Her business never quite gets the upper hand, and it isn’t helped any when Thelma’s granddaughter’s mother-in-law-to-be dies suddenly right there in the tearoom. Soon, Sophie is trying to untangle the web of connections between families and businesses in Gracious Grove to figure out who could have murdered the woman and why. 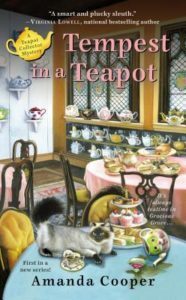 In the second book, Rose and her business partner (and best friend) Laverne go to the annual International Teapot Collectors Society convention together for the first time, since Sophie is still in Gracious Grove to mind the shop. Their jaunt takes a nasty turn when the state ITCS president is murdered in the night… after a public argument with Rose over identification of a peculiar teapot. Since said teapot is found next to the body, Rose quickly becomes the suspect everyone is watching. Sophie drives up to assist in finding the real killer. At the opening of the third book, Rose has had a health scare, and Sophie wants to help out in any way she can. The town’s annual Tea Stroll is coming up, there’s some sort of scandal going on at the local college, and – eventually – a man turns up dead on the Auntie Rose’s Victorian Tea House property. This is a fun series, with a cast of quirky recurring characters who get into each other’s business the way people will in a small town. While Sophie grew up in a moneyed family, with luxuries like a vacation house in the Hamptons and an education at private boarding schools, all she wanted as a teenager was to stay at her grandmother’s house in Gracious Grove with the kids she was able to hang out with during her visits. A number of those kids are now the adults of Gracious Grove, and Sophie runs into a few bumps trying to fit back in. The narrative shifts between characters: while it returns frequently to Sophie, the scenes are sometimes viewed through the eyes of Rose or Thelma Mae. The sections told from Thelma Mae’s point of view are particularly interesting, making a character who could have been a flat stereotype of a cranky old lady into someone more real. I could understand why she does some of the things she does, even as I would like to tell her, “No! Don’t do that! Just go talk to Rose!” It’s a good thing the characters are interesting in their own right, since it takes a while to get the mystery in each book, especially the third one. There’s also a very slow burn romance developing for Sophie, which is very sweet. And each book includes tips on tea and a recipe for a little treat. I hope there will be more installments in the series.